Will Wrist Straps Increase Your Muscle Gains? 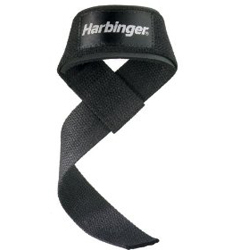 If you want maximum performance from your weight lifting sessions then you should invest in a pair of wrist straps. Take a heavy lift like deadlifts. Once you get to a certain level of strength, the weight you are lifting is going to make it so that your wrists meet positive failure before your back does. This means that although you are genuinely working to the last rep you can possibly complete, you don’t actually achieve maximum overload on the intended muscle. Nice forearm workout for sure, but that’s not what you wanted! The solution is therefore to take some of the load off the wrists and enable the intended muscle to reach its point of positive failure. Imagine, you could be underperforming in ALL of the above if you go without the necessary wrist support! Wrist straps actually make it so that you hardly have to expend any precious energy holding the bar and can focus your juice on your back and/or traps. Note: this does not apply to beginners as the weight lifted will not be heavy enough to cause any problem with wrist strength. Here’s a nice little video I found from bodybuilding.com demonstrating the correct method, check it out…. If you’ve been lifting for a year or more I would certainly advise that you invest in a pair of straps. For around $6-$7 a pair, they’re an absolute bargain. @ SP. Yeah, they’re so cheap it’s a no brainer. @ shashank. Diet is thoroughly covered on this site. Do a search or download the free book. Great topic to discuss. When I worked at a gym in Miami, bodybuilders there would always opt for straps. For a simple reason – their wrist/hand strength just couldn’t catch up to their back strength. While the idea of crazy-strong wrist strength is nice, the back muscles are losing out. Funny enough, some younger kids in the gym would absolutely refuse straps because they thought it somehow was a cop out. Funny how your mentality in the gym makes all the difference. I’m not sure if I read it on this site, but I read somewhere that wrist straps mean your wrists dont get alot stronger in terms of the gain in weight you lift so that if you try lift without the straps your wrists cannot take the weight at all? @ Blake. Good point! They definitely need replacing every so often. @ Rob. No, it wasn’t here. A back exercise is a back exercise, that’s where we need to direct the overload. When your back gets to a certain level of strength, your wrists will not hold out, period. In order to get the most out of each set, wrist straps are very important. The wrists get so much indirect work throughout the week anyway. Why have wraps not occurred to me before? Years ago, I broke a bone on the medial aspect of my right wrist. It’ll never heal, but that’s not a problem outside of the gym. When I go to lift dumbbells > 70lbs off the rack, my wrist always feels like it has dislocated for a moment… a very unnerving moment when you are holding something that could destroy a toe. This also causes me to give out of chinups, lat pulldowns, etc sooner than I should. Amazon.com here I come. Do you usually use the straps with a pair of gloves? I was just wondering after reading your article on gloves where you recommend a pair with wrist wraps. Hi Aaron, you should certainly use them and I hope others learn from your experience. Yes I use them with gloves. The gloves only provide wrist support which is certainly welcome for all lifts but actual wrist straps are required for the heavy lifts I have listed as the strap wraps around the bar itself and basically holds it for you. It’s different from the feature of the gloves. Both can be used together if you want to do that. I began using lifting straps on my upright rows and my strength gains have been fantastic. I was worried that the straps might hurt at the top of the movement as my wrists flair out, but it’s not an issue. The exercise is much more comfortable this way, with straps.